Around 2,000 people gathered in Manchester to protest against austerity and the government's “callous cuts” over the past five years. Extra police officers were assigned to ensure the event ran peacefully. The protest, organized on social media, took place in Piccadilly Gardens in the city centre. The event kicked off with a welcome from Penny Hicks, convener of the Manchester chapter of The People's Assembly Against Austerity. After meeting in Piccadilly Gardens, some of the protesters marched through the city shouting "Revolution!" Those in attendance included the Manchester branch of The People's Assembly Against Austerity, along with union members from across the region. Various campaign groups also joined. Young people also took part in the protest. Holding up a sign that said 'No Cuts,' 16-year-old Ben Little told Manchester Evening News that he “can't vote so this is the only way I can have a say. Even though I am affected by the country's future I have no say in it." Others had more personal reasons for demonstrating. "Austerity is cruel and severe and that's why there is so many people here today. I had my house repossessed last week. I got to the point where I started to suffer from depression and am now unemployed, everyone here has their own stories to tell,” protester Paul Mallinson said. Liam Callacher, one of the organizers of the event, said the facilitators were “overwhelmed" with the protest's success, adding that he believes around 2,000 people attended. The 10 Greater Manchester authorities faced cuts of more than a quarter of a billion pounds (US$387 billion) in 2015. This was on top of the £1.2 billion ($1.85 billion) of cuts since the last government's austerity measures were introduced in 2010. Chancellor George Osborne has warned the cuts will continue under the Conservatives. Labour leaders, including Manchester council chief Sir Richards Leese, have also warned the region faces another Conservative onslaught. The protest comes days before the Tories set out their legislative plan in the Queen's Speech. Meanwhile, a separate protest was taking place in St. Ann's Square on Saturday, with homeless people setting up camp after fighting for support from the council for the past few weeks. 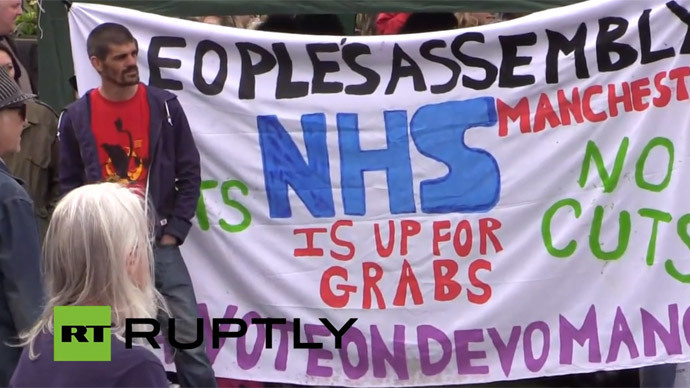 An anti-austerity demonstration last month outside the city's Town Hall saw several protesters storm the building.